How are you guys today? It’s going to be insanely hot here and I’m not sure I’m ready for it. This morning I woke up at 5am to get in a nice run before the heat index went off the charts and the air quality became to poor to run outside, and even at that early hour the humid stickiness had already set it. All I want to do is sit in front of of my air conditioner eating ice cream; what I don’t want to do, is use my stove. At all. As you got to see back in March in my house tour post, I live in an old house. A house built in 1880, very old for the USA. It’s a wonderful house but like all houses, there are things I’d love to add, air conditioning is one of the things I’d love to have in our home. But at $10K and up, we can live with window units for a while. The problem however lies with the kitchen. There is but one kitchen window and its directly over the sink, where I stand more than anywhere else in the kitchen. Putting a A/C unit there would not be a good idea, I’d probably catch pneumonia standing in front of it with wet hands for hours a day. The kitchen is cut off from the rest of the first floor and noticeably hotter, turn on the stove or the oven and forget it, it becomes a sauna. This Summer, I will attempt to cook inside as little as possible on these hot days, this means some major grilling will occur or we’ll be eating something cold. Ice cream really isn’t a completely bad dinner or better yet, frozen yogurt… How will you guys be beating the heat the next few days? Are you like me and don’t have central air? I have some great posts in my queue that need to be finished for you guys but stay tuned. I’ll be recapping our trip up to Vermont this past weekend as well as giving you some great new recipes. Lastly, don’t forget to check your local orchards for their fruit ripening dates. I just saw that tart/pie cherries are just coming in season and they only last about a week around here. You don’t want to miss that fresh cherry pie! I’ve gotten some great feedback about the strawberry cake I posted last week. Lots of you have printed out the recipe and some have already made it and fallen in love with it! This is why I blog. I love sharing recipes that become successful for others; there truly is nothing that bring people together more than food. The strawberries are still around at our Lancaster Central Market and for me, they are irresistible. Since they have such a short season and taste so incredibly compared to the year-round California strawberries you can always find overpriced at the grocery store, I feel like I must eat as many as possible so that I can last until next year. As I walked through rows of stands at market last week, eyeing up the pretty produce and the first ears of corn I found myself buying another quart of those sweet red berries, with no clue what I was going to make with them. The answer ended up being an deliciously elegant strawberry tart! 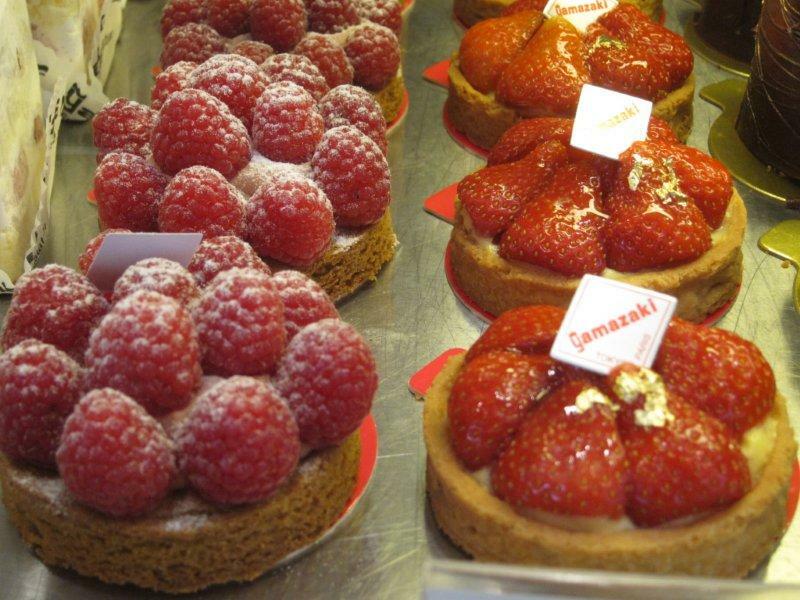 The gorgeous little strawberry tarts that can be found in pastry windows all over Paris. They’re light and rich at the same time with the perfect balance of custard and fruit. I’ve always wanted to make one but thought they looked complicated. This time I decided to go for it. I was right, they are complicated but if you break down all the steps and do a few ahead of time, the process seems much more manageable. I used Julia Child’s Strawberry tart recipe and mixed up the tart crust dough and the custard the day before we were to eat the tart. The following day, about 2 hours before I wanted to eat the tart (because you don’t want it to get soggy) I rolled out and baked the tart shell completely. When it was cool, I brushed it with glaze to create and extra seal and prevent additional sogginess and then filled the shell with the custard. I actually needed more strawberries, I thought a whole quart would be enough, but was very wrong, I think needed a second whole quart to really cover the top! No matter, we ate the tart for dessert and it was perfect. 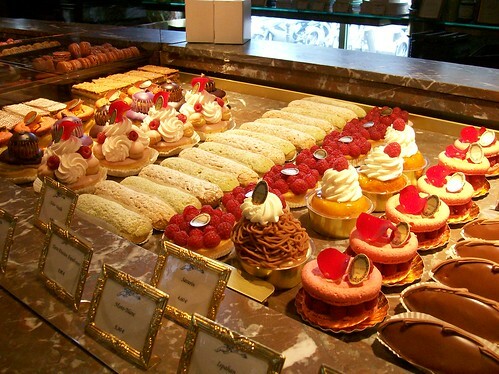 Took me straight back to a pastry shop in Paris. Place flour, salt, sugar, butter and vegetable shortening in a big mixing bowl. Rub the flour and fat together rapidly between the tips of your fingers until the fat is broken into pieces the size of oatmeal flakes. Add the water and blend quickly with one hand, rapidly gather the dough into a mass. Then press the dough firmly into a roughly shaped ball. It should just hold together and be pliable, but not sticky. Place the dough on a lightly floured pastry board. With the heel of one hand rapidly press the pastry by two-spoonful bits down the board and away from you in a firm, quick smear of about 6 inches. This constitutes the final blending of fat and flour. With a scraper or spatula, gather the dough again into a mass; knead it briefly into a fairly smooth round ball. Sprinkle it lightly with flour and wrap it in waxed paper. Refrigerate for 2 hours or over night. Rolling out the dough after taking out the fridge to cover and press into the base. Press a decorative edge around the rim of the pastry with the dull edge of a knife. Prick the sides and bottom of pastry lightly with a fork. To keep the sides of the pastry shell from collapsing and the bottom from puffing up, line the pastry with buttered, lightweight foil. For a fully cooked shell, bake 15-19 minutes until the shell is very lightly browned. Gradually beat the sugar into the egg yolks in a mixing bowl by a wire whip or electric beater and continue beating for 2 – 3 minutes until the mixture is pale yellow and forms the ribbon. Pour the mixture into a saucepan and set over moderately high beat. Stir with wire whip, reaching all over bottom of pan. Turn down to low heat until the sauce becomes lumpy and beat for another 2 – 3 minutes to cook the flour. Boil the currant jelly, sugar and liqueur in a small saucepan until last drops from spoon are sticky. Paint the interior of the shell with a thin coating of the glaze and allow to set for 5 miniutes. Spread a 1/2 inch layer of crème pâtissière in the bottom of the pastry shell. Arrange a design of strawberries over the cream. Spoon or paint over them a thin coating of the glaze, and the tart is ready to serve. We’re now at the tail end of strawberry season and this year I found an amazing recipe for strawberry cake. It’s not a traditional cake with icing but more of a coffee cake like cake. I love it because it has wonderful texture and flavor, uses lots of fresh strawberries and can be whipped up in about 20 minutes plus baking time. It also looks beautiful. It was so good that last week I made it two days in a row! I made it to take to dinner with some friends on Saturday and we left the rest of the cake with them to enjoy but it was so good that the next day I used my left over strawberries to whip up another just for us. Eric has been away on business all week so I’ve been eating a slice each night after dinner and it lasted me until last night! I love having something homemade to look forward to after dinner. Originally, I found this recipe from Pinterest and printed the recipe from Smitten Kitchen and then I tweaked it. The recipe called for all white sugar and after thinking it through, I’m a brown sugar kinda girl. I love how it adds flavor, especially when using it with fruit so I opted to halve the sugar and add half brown sugar and half white sugar to the batter. It was a good way to go. The batter had a hint of chocolate chip cookie dough taste to it when I tested it and that can never be bad! Begin the recipe by hulling and slicing the strawberries in half. Cream the sugars and butter. Mix up the dry ingredients in a separate bowl. Add vanilla and egg to the creamed butter and then the milk. Slowly mix in the dry ingredients just until combined, be careful not to over mix. Pour the batter into a buttered spring form pan. Place the strawberries lightly into the batter, cut side down. Lay them out and fill the entire pan. Try not to layer them too much but if you must to fit them all on, that’s OK. Sprinkle the top of the cake with 2 tablespoons of white sugar (when it bakes, this turns the strawberries into a gooey jam!). Bake at 350 degrees for 10 minutes and then reduce the temperature down to 325 degrees and bake for 1 hour, until a toothpick inserted comes out clean. Once the cake is cool, pop it out of the spring form pan and put it on a pretty plate. Right before serving, dust the top with powered sugar. Serve with a dollop of whipped cream. Like I said, so easy, so pretty and so delicious. Plus, you can use strawberries that are a little too ripe, once baked down they taste great! Happy June everyone, where did May go?! Preheat oven to 350°F. Butter a 9-inch spring form pan. Whisk flour or flours, baking powder and salt together in a small bowl. In a larger bowl, beat butter and 1/2 cup white sugar and 1/2 cup light brown sugar until pale and fluffy with an electric mixer, about 3 minutes. Mix in egg, milk and vanilla until just combined. Add dry mixture gradually, mixing until just smooth.